Like the best of Vlambeers cannon, a simple concept executed beautifully. Limited enemy and level design, though. Here's a little language lesson: "luft" in German means air, and "raus" means empty. "Rausers" is a made up word, but it roughly translates into "emptiers". Dutch studio Vlambeer's modular vocabulary is apt, because Luftrausers (or Airemptiers) is about grafting together plane parts you've earned from blasting things out of the sky, creating hybridised monstrosities, and blasting things again. There are 125 different combinations of weapons, bodies, and propulsion systems. The gungine (another creative portmanteau) propels you with bullets, while the ramjet is capable of scary-fast superboosts. A body that looks like some sort of skybound diving bells grants more health but slower movement, whereas one serrated like a swordfish lets you knife through enemies with zero damage penalties. Weapon-wise, the contact beam fires futuristic lasers, the machine gun unleashes thick streams of white hot bullets, and the karaterrauser shoots five massive shells that kickback hard. Like the game's title these parts mean nothing alone, but bolt them together and you'll create custom definitions. In fact, every combination has an actual name. A gungine and laser mounted onto the standard chassis is called a "pilot party", while attaching a superboost to an armoured body that fires shells goes by "the pig". Aquatic propulsion, heavy armor, and homing missiles? "Blastoise". Different combinations enable different strategies. I count myself a pioneer of the "bullet out the backside" strategy, centred on one ingenious weapon that fires from the rear when you boost. With it, I'd approach enemy battleships from above, firing from the front, then turn and boost away, a second round of rear fire doubling the damage. The swordfish chassis, meanwhile, effectively turned my plane into an airborne battering ram and led me into whole new patterns of combat. Patterns of combat where I'd, you know, fly into things. My go-to weapon was a shotgun-like blaster that proved effective—more effective than the comparatively narrow streams of the standard gun or laser, anyway—on enemy clusters. Those clusters are a little too frequent. While your tactics vary, enemy waves repeat. They mostly just tail you like hungry dogs—little dogs, medium-sized dogs and the occasional big dog, but dogs all the same. The result is a game containing many ways to attack but fewer ways to defend. Even music is compartmentalised. Each plane part comes with its own musical hook, meaning melodies and bass lines organically intermingle depending on what you're flying. sound has applications outside of sounding cool—a refrain plays when you're about to explode. Meeting challenges wins you weapons, engines, and bodies. Kill a boat while on fire or explode three different enemy types, for instance, to rank up. Handling is versatile, if dauntingly fast and a little erratic, with pilots able to pirouette, loop-the-loop, and stall during almost balletic routines. Nothing beats being chased by a dozen desperate jets, only to cut the engine, pull a 180 degree turn and fire into the flock. The forces of momentum are hard at work underneath basic pixel visuals. Speaking of which, even they have more depth than it seems initially. Planes and missiles are reflected in the water and flying too close to it throws up spray, while thick black smoke streams from your exhaust the more you take damage. This justifies the lack of health bar—fights are so frantic in Luftrausers that even a momentary off-screen glance might prove costly. Health regenerates if you stay out of the fight and off the fire button, and just to make Luftrausers even more playable, Vlambeer have viciously incorporated insta-restarts, the cads. 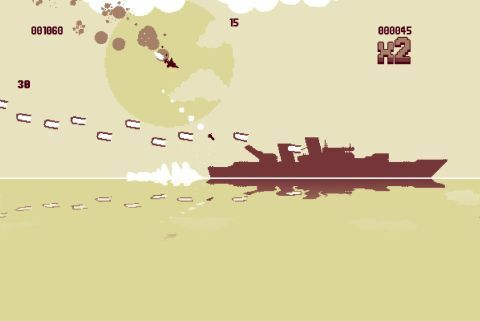 Deceptive depth aside, Luftrausers remains basic in ambition. The one-stage setting soon becomes visually repetitive, and the space proves limiting, players given a thin wedge between clouds and sea in which to manoeuvre. This is especially damaging given the sheer speed at which you travel. Still, these problems don't kill the engine—they merely make it splutter. Like its name, separate parts combine to form a game that just makes sense.